Never assume that you’re stuck with the way things are right now. You aren’t. Things can change if you want them to, at any age. Life changes every single moment, and so can you. The interesting thing about this sentiment, I think, is that our whole lives have been leading up to every moment. Think about that for a second. Every single thing you’ve gone through in life, every high, every low, and everything in between, it has all led you to the moment you’re experiencing right now. Start with a simple question: What do you want to change in your life? Are you hoping to someday be in better physical shape, a runner, a writer, an artist, a graphic designer, a programmer, a teacher, a better parent, a successful entrepreneur, or an expert at something specific? How do you get to where you want to go? Do you write your intention on a note card, and place it in a bottle and cast it out to sea, hoping the universe reads it and manifests it in your life? No. The universe isn’t going to make your desires happen. You are. Do you set yourself a concrete goal to complete within a year, or within three years? Sure, but that alone doesn’t get the job done. In fact, if you think back on previous examples in your life, setting lofty, long-term goals probably hasn’t worked for you very often. How many times has this strategy led you to the outcome you desired? Here’s the truth: Goals don’t make positive changes happen, rituals do. What’s the difference between goals and rituals? If you’re a bodybuilder, your goal is to win a bodybuilding championship. Your ritual is what you do to train your body at the gym each day. If you’re a fiction writer, your goal is to write a novel. Your ritual is the writing schedule you follow each day. If you’re a parent, your goal is to be a great role model. Your ritual is the time and energy you commit to setting a great example each day. If you’re an entrepreneur, your goal is to build a successful business. Your ritual is your daily work ethic combined with your marketing and sales process. Now think about this: If you ignored your goals for a while and focused solely on your rituals, would you still get positive results? For example, if you were trying to lose weight and you ignored your goal to lose 20 pounds, and instead focused only on eating healthy and exercising each day, would you still get results? Yes, you would. Gradually, you would get closer and closer to your goal without even thinking about it again. Nothing will change unless you make a daily ritual that reinforces your goal. I’ve tried weekly action steps with people, things they do every other day, big monthly milestones, and dozens of other variations and combinations of strategies. None of them work well in the long run except daily rituals. If you’re not willing to make it a daily ritual, you don’t really want to change your life as much as you say you do. You only like the idea of learning to be fit/writing a book/building a business/selling your art/etc. You don’t actually want to do it, every day. Bottom line: If you want it as much as you say you do, make it a daily ritual. Lose weight – Start walking every evening before you eat dinner, for 10 minutes at first, then increase to 15 minutes after you’ve completed a month, then 20 minutes after another month passes, and so forth. Once you are walking for 45+ minutes a day, make another change – drink water instead of soda/sugary juice. Write a book – Write for 10 minutes a day for a month straight, then step it up to 15 minutes a day, etc. Eventually settle into a daily ritual of 1-2 hours of uninterrupted writing a day. Stop procrastinating – For most of us, our minds operate at peak performance in the morning hours when we’re well rested. So obviously it would be foolish to use this time for a trivial task like checking Facebook. These peak performance hours should be 100% dedicated to working on rituals that bring you closer to your goals. A possible daily ritual: Set a ‘most important task’ each morning, then work on it for 10-30 minutes before opening your web browser/smart phone/etc. Fall in love with the right person – You have to put yourself out there. Go somewhere each day and meet and socialize with like-minded people. Here’s a good read on meeting the right people. Be happier – do something small each day to make the world better, to help people, and to love yourself. Learn a new language – Study your chosen foreign language using Livemocha or listen to Pimsleur audio for 10-30 minutes a day. Travel the world – Save money (see the next point). Or start selling your unnecessary belongings, so you can carry your needed belongings in a backpack. Learn to live with less. Then book budget-conscious travel arrangements with the money you made from selling the non-essentials. Save money – Begin by cutting out smaller expenses (like $7 Starbucks lattes). Start cooking and eating at home. Sell your car and bike/walk/take the train. Downsize to a smaller (or less expensive) home. Enjoy simple pleasures and free activities, instead of buying stuff. Read more books – Read every morning for 10-15 minutes and every evening again for another 10-15 minutes before you go to bed. You get the idea. Not all of these specific rituals will work for you and your unique situation, but you could come up with something similar that works better for you. In any case, the principle applies: Create a ritual and live by it daily. And of course, if you’re struggling with any of this, know that you are not alone. Many of us are right there with you, working hard to make positive changes, think more clearly, and get our lives back on track. 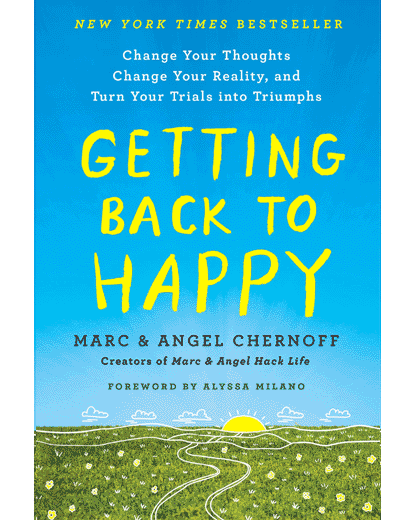 This is precisely why Angel and I built “Getting Back to Happy.” The course is filled with time-tested steps on how to do just that. We’d love to work with you directly, if you’re up to it. What’s one change you want to make in your life? What’s one new ritual you’d like to begin? Tell me about it. Leave a comment below and share your thoughts. Excellent post. Daily rituals have been a life-saver for me. From personal experience, if you really want to make sure you’re consistently on the right track, create a system for yourself. Often times we forget all the things we have to keep track of, so using some sort of program to organize will be optimal … such as Google Calendar as Marc mentioned. When we do this, we can plan ahead many days in advance while at the same time using our energy to focus on the present. Then, as this post suggests, establish a ritual, and then, while it may be tiring at first and hard to keep, your brain will adjust to the changes and your momentum will build. Excellent perspective, Christian. Thank you. Replacing the phrase “I have to” with “I get to” in all of my self-talk. Such a lovely concept! Makes the difference between being a victim of something or learning from and appreciating it. I’m already noticing positive effects from this small daily change. For example, my bike’s accelerator cable snapped while I was leaving from home yesterday morning. My friend said I had bad luck. I said it was great luck because it happened close to home and not on a bustling highway. Mara, so glad to hear you’re continuing to find value in the course. Working with you and watching for progress over the last couple months has been inspiring. I am the queen of procrastination. I put off the positive things I need to do way too often. So this post was perfect for me… it helped me look some of my excuses with the mindset of eliminating them via small, positive daily rituals. Thank you for giving me some solid ideas for fighting the urge to let things go. Rituals are absolutely the way to go. I’ve tried it with so many things especially walking, and my walking buddy and I keep each other accountable. I’m started a new ritual for keeping on top of my to do list and I hope I’m as successful with that. Thanks for this reminder. Setting goals are extremely important and as you stated so eloquently it is those small steps that are taken daily or frequently enough that will allow you to achieve those goals. I was truly encouraged and inspired to continue with my rituals and those that I have neglected to resume them. Consistency is the key to achieving ones goal. Fantastic post! Taking action and being in the right frame of being has massively helped me to shift a massive amount in my life. from just making small steps with things to massive leaps of faith, following through in this way has really enabled me to catapult along the path to creating the reality I wish to live. Things really shifted for me this year with my business and my love life from doing things this way. Rather than questioning things I flipped around to just saying yes and then working out how to do stuff, I released a new CD in May which is enjoying good success following a casual chat with a contact, there are two more now in the pipeline which will come out in a couple of weeks. Plus even better is that I started dating an amazing lady earlier this year and we are now set to get married in March of 2016. Taking positive action, even small amounts of it, can truly make a massive difference to achieving joyful living and dreams! My daily activity has a great deal of flexibility as that leaves me open to new opportunities that aid with success, the things I do definitely underpin good results much as is in-line with the suggestions here though. Great post, thanks for putting it out to help everyone! Thank you for sharing a piece of your inspiring story, Stephen. I love that you’re making gradual progress in both your personal and professional lives simultaneously. Sounds like you’ve found a great balance. Cheers! I laughed at donating $100 to a political campaign you’re not fond of! That’s clever, and quite serious. I’m currently working on sticking with the schedule. You’re right about triggers. I look around and I only see around 10% of effective triggers. Need to work it out! Thank you as always. This has such a ring of truth and is very motivating to me. I think this approach ( and its evident truth) is very helpful, especially if you have mild depression and find focussing on ambitious long term goals difficult or not motivating. It is manageable and appropriate sometimes to focus on each day clearly but with a gentle confidence that you are travelling in a good direction. I’m sure that over a short while any positive new rituals will start to have an effect. I’m going to think about one or two – NOW, and make sure they can be started today. Once again you remind all that it is positive changes, baby steps at a time that work. One day. one step at a time and any change you want make will be made by making it part of daily living. I have had many struggles over the last few years and always find that it is the positive daily changes that have really made life better along the way. This advice is so good! Above, I vote for #3 as the best personal insight of the list–I also have a make-a-down-to-the-quarter-hour-schedule-and-feel-guilty-about-botching-it problem. Katherine, it sounds like you could really benefit from reading Steven Covey’s The 7 Habits of Highly Effective People – specifically Habit 3, which goes into scheduling and time management. I am just like you with to-do lists, and this section of the book has opened my eyes to organizing my priorities based on my goals and values, and managing my time and schedule from there. I’m very grateful to have your blog as a guide…. Since I’ve been reading your blog I’ve been making significant progress in my life. Thank you so much for another wonderful and helpful article. I really need it. After reading it I feel so motivated and positive.I am going to follow one or two rituals daily and try to take my life on right track. I am sure it’s going to work for me. Its been a while since I commented. After having back surgery a month ago, my whole system is no longer working. Work is tougher than ever, my concentration is shot and the pain and numbness in my leg has left me limping by the end of every day. My bloodwork made it clear that I have to start changing my habits: NOW. So, having made the decision on Friday, I have had a slew of references to habit s and rituals end up in my emails and post notifications. Its not a coincidence, they are far too removed from each other to have overlap like this. Anyway, it has sparked me to get serious about the changes needed. Cheers to starting some positive, healthy rituals! Wishing you the best, David. Thank you for the great tips. Having been a bodybuilder for 30 years, I live by daily rituals as far as workouts and eating are concerned. However, I neglected to instill them in my new goals for this stage of my life. I’m learning a new language and now I know I must practice every morning. Daily! No wonder the “four days a week” plan didn’t pan out for me, Thanks! Just transfer the principles of discipline you learned from bodybuilding to your venture in language learning. You’ll find your rhythm, and you’ll succeed. I have no doubt. As a creative: visual artist, poet/creative writer, & singer, as well as a solo single parent, i found it often a major struggle to do what i was born to: create. The concept of creating rituals can be tweaked a bit to accommodate creative endeavors, which often don’t neatly fit into a schedule: in order to get into your zone, it’s essential to clear your mind from the clutter of externals. I’ve found that when attempting something creative such as editorial illustration while sitting in a non-AC apartment on a hot summer day with your child blessedly napping in the next room (but liable to wake up at any minute), loud street noises coming in the window, and a deadline hanging over your head (yes, i actually HAVE been in this situation)…you actually CAN accomplish a creative task, by inviting your creativity in. I set my box fan in a position that would gently blow air toward my legs (i still got the cooling breeze, but my papers weren’t blowing all over the place), got out my personal CD player, & began listening to some of my favorite music that thematically matched the subject matter i was trying to conceptualize as an illustration. Then i did some warm-up sketching for about 10-15 minutes…and when i felt ready, knocked out the drawing (which i’d been thinking about for days, just mentally percolating it) in about 30 minutes! I’d learned several years before, that if a drawing feels too “tight” or stilted, i’m trying too hard…& need to re-set my brain…so i’ve gone out to listen to live music for a couple of hours, come home by midnight, gone to sleep for ~3 or 4 hours, then voilá! At 4 am, my brain was rested, my thinking clear, & the door was wide open to my creative engine room…AND my piece was done on time. And, to best bonus of all: it looked far better than it ever could have, had i sweated and stressed over it for hours. Since then, i’ve applied this concept in many ways: when i didn’t have the time or money to take an open-studio class, i’d write poetry…and eventually, short story dialogues; when i needed primal scream therapy, i’d scrape together a few dollars, go to my favorite karaoke spot, and belt out some classic soul or blues (i taught myself to sing this way, and have actually gotten kinda…good). For me, creativity must be invited into the brain…so music is integral. Even though i’ve never had much money, i’ve always prioritized having music in my life. I prefer to find CDs that i enjoy, rather than listen to the radio (especially commercial radio). Even Pandora doesn’t always work for me…but to each their own. Back in 2000, i made a commitment to myself to live from my creative, rather than my analytical, brain…and it’s a choice i have never regretted. Excellent perspective, Santiba. Thank you. Thank you so much for this reminder, Marc and Angel. I am working towards my goal every day, I revise at least an hour or more and just focus on that. There are days where I am like ughh, I can’t be bothered, but I still commit 15/20 minute of my time to revising, even it’s just a little bit. After reading this article, I’ve realised that I must reflect upon this progress I am making, so I can appreciate the hard work, time and effort I am putting into it. This, in turn, will help encourage and motivate me to carry on being productive. It’s so much better thinking about them as Rituals. Thank you for showing me this shift. Great article! For me, planning ahead is HUGE. I’ve noticed a very large improvement in my daily rituals if I set aside time to plan my week and then plan each day. If I don’t plan, I waste time and all those little daily rituals fall by the wayside. I’ve learned a lot from this article -thank you! I really really really want to become a married woman and a mother. So I need to pick up the pieces of my disastrous dating history, and go find the right one who is ready to love me back. Words are not enough to describe how fabulous and inspirational persons you are. You’ve touched my heart and mind with so many blessings with your words of wisdom and helping tips. You came in to my life in a time when I was experiencing a gloom. I wanna reveal you a secret: I was in love with the English language and the American lifestyle from a very young age. This feeling has amplified since I started to read your blogs. I have a great pleasure to read in English your advice especially that It touches me deeply in every aspect of my life. Please complete my joy with a comment. Even a short one suffices. Thank you thank you thank you sooo… much. I love you and God bless you. I find these ideas to be vey helpful. I am taking small steps with what I have, where I am. They are focused in the same direction without losing site of my big dream. “What saves a man is to take a step. Then another step. It is always the same step, but you have to take it.” ~Antoine de Saint-Exupéry, Wind, Sand and Stars, 1939, translated from French by Lewis Galantière. These are great tips for changing one’s life. I made a personal transition in my life just over a year ago and I’m happy with my results so far. I wish I had the information that you have shared here, things might have transitioned for me a little smoother. Never the less I have no regrets, I am 40 pounds lighter and I am now persuing my dream to become a successful business owner. I will definitely implement the tips that you offered here, specifically to make my goals into daily rituals and inviting people to keep me accountable. I read all your posts and find them very useful … thank you so much. Hi Marc and Angel, I am Anthony from Kenya and I am so glad I happen to come across this article. What rituals should I adopt to be a successful Financial Advisor in Insurance and Investment. Thanks big time. Thank you for this post! I’m so glad I read this article. This is very inspiring. I will start reading everyday!